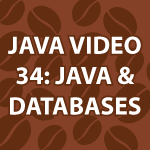 In this part of the Java Video Tutorial I show you how to setup Java JDBC in Eclipse. I then cover how to connect to a MySQL database, query it and get the results of a query. We also look at the Exceptions you’ll need and much more. I will cover SQL in this tutorial, but not to the extent that I did in the past. My SQL tutorials can be found after the video. There are a couple of ways to setup JDBC in Eclipse. First You need to get JDBC Connector. Just copy the jar file above to the directory /System/Library/Java/Extensions. That is it! thanks for informative tutorial again. Excellent video tutorial series on Java. Thank you. I’m glad you like it. I plan to cover as much as I can. hey nice, you started with jdbc, great..
please cover as much as possible, as usual..
also callable statement, how to display data from multiple tables(joins), and all..
if possible create one standalone application in swing with database, that covers all. Hey, thanks alot, great information. I’m trying write a short java code that connects to a MySQL database, but I don’t want to hardcode the password at all into my code (Security reasons, obviously). Can you please show how to do such a thing? keep up those great vids! I have just discovery this website and i have watch about 5 videos. Your work is wonderful and it is very helpful i think for all. I was seraching something about java Generics. maybe you have any video around but i will take the time watching something before. Thnks for your work man from Italy!!! Did you set up mysql and add the user required? Basically the error is just saying that you don’t have the permissions needed to execute the code. I also tried to add it through the class path but it lead to the same result. Please let me know how I can fix this. Also, thank you for the awesome tutorials. Hi again Derek! I am completely new to SQL, thus my description of the problem(s) is going to look a bit like a Neanderthal trying to describe the latest iPhone (I’ll TRY to limit the grunting and monitor-beating-with-a-stick). Windows machine here. If I go here … http://dev.mysql.com/downloads/connector/j/ … and select Microsoft Windows, I have just the option of downloading mysql-connector-java-gpl-5.1.26.msi. When I click it after downloading, a window BRIEFLY pops up(“Please wait while Windows configures …”), and then … nothing. Doing that multiple times (and going into the Task Manager seems to confirm that nothing happens). On that same page, if I select Platform Independent, I’m then given the option of downloading the .zip. Downloading, extracting, and using the Eclipse option that you describe at about the 1:20 mark in the video … everything seems to be fine. Then at the 1:58 mark of the video, you bring up a Terminal. So first question … Is this window the Apple equivalent of the Windows CMD Prompt window? And, if so, do you have any recommendations on Command Line tutorials (I’ve avoided Command Line like Ebola for all of my 18 years of computer semi-literacy). From there, copying the Java code and pasting it into a .java via Eclipse … no errors! However, I don’t have my own UserID and Password. So second question … what am I supposed to register/sign up for here in order to learn SQL? I can’t seem to find an explanation anywhere of how all of this fits together. Every explanation that I can find seems to begin with actually using SQL commands and not setup. I’ve also installed WAMPSERVER because it seemed like the thing to do at the time (Beer number three, I think). Thank you for all of these videos and any help that you might have in this situation! Funny post 🙂 I’ll do my best to help you with this. Q. Is this window the Apple equivalent of the Windows CMD Prompt window? A. Yes they are pretty much the same thing. The difference is that Macs are pretty much Linux operating systems while Windows uses different commands. The easiest solution is to install something like WUBI. It is just like installing Linux on your Windows machine as an application. Then you’ll be able to easily install all of this stuff. If you decide you don’t like WUBI you can just uninstall it like any other application. Tell me if you have any other questions, but I think that is the easiest solution. Sorry about the late reply. I was out of town. At the top of my computer science education goals is to master Java completely, then Android, and then to set up an older computer with a flavor of Linux (Ubuntu, Mint, etc.). I’m going to hold off on the SQL tutorials until that time and focus on the Java and Android tutorials for now. You’re very welcome 🙂 I have pretty much everything you need to learn java. I’ll keep making Android tutorials for about another 6 months or more. I hope they help. I was a bit stumped! I saw you were writing in a terminal on a Mac, and maybe I was just being silly, but I was in MySQL using the MySQL command line. The Command Prompt for windows was not working, how can I troubleshoot this? You’ll have to add MySQL to your path. Here is information on that. I am working on XP, so in addition to mysql connector, i also need Mysql DB server itself, to connect to it. Your tutorials are a big help thanks a lot. Hi thanks a lot but I tried but without luck I just made the customer database you made by doing your tutorials SQL Video Tutorial Pt 1-2-3-4 and 5 and it worked out perfectly they are really good. I’m glad you fixed it. Sorry i couldn’t get to you quicker. Nice tutorials! Keep the good work up..